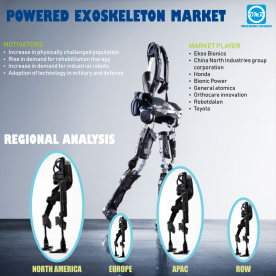 INDORE, India - Oct. 31, 2018 - PRLog -- "Adoption of technology in military and defense are driving the powered exoskeleton market"
According to the OMR analysis, the powered Skelton market is growing at a significant rate during 2018-2023. The powered exoskeletons are designed to physically assist and protect the wearer, which includes soldiers, construction workers and people surviving in dangerous environments. The powered exoskeleton is high-technological robotic device, which is expanding its capabilities in various fields which includes healthcare, military, industrial and others. Due to rapid development of science and technology, the powered exoskeleton is contributing in healthcare sector, and provide ways or action to mitigate neural and physical disorder. The report provides detailed and insightful chapters on market overview, key findings, strategic recommendations, market estimations, market determinants, key company analysis, market insights, company profiling, market segmentation, geographical analysis and analyst insights. The heavy weight and height of equipment's and strict government regulations are hindering the growth of market. However, some countries are involved in identifying solutions to deal with certain issues regarding powered Skelton. The powered exoskeleton is expanding its potential in military and defense and enables in changing the world with technology. The adoption of powered exoskeleton is growing among which the US have military exoskeletons under development. Whereas the defense industry needs light weight exoskeleton with long battery life.